Inclusions: Fully engineered as a Class 1 (Habitable Dwelling), prefabricated in Australia from quality materials, the Steeline Hunter backyard pod kit includes flooring system and flooring (Yellow Tongue); heavy-duty wall frames; corrugated Colorbond® exterior walls; wall sarking (thermal barrier); low-profile skillion Zincalume® roof with Permastop fibreglass roof insulation; guttering system (rear); screws and fixings; full drawings and instructions for DIY installation or local tradesperson; optional foundation piers. Choose from the full range of Colorbond® colours for exterior walls. Exclusions: Add your own choice of doors, windows, floor covering, wall lining, etc, to finish and personalise your pod. Dimensions: Pod size is based on external wall measurements. Height from existing ground-level to roof ridge (including piers) can be within 3m. Internal ceiling height approx. 2450mm to 2650mm (sloping). Skillion roof pitch 5°. Shipping: Any auto-estimates are approximate and depend on the details of your location, proposed site, and kit. We will quote shipping specifics before finalising your order. Payment: If you need a quote on shipping and/or installation before finalising your order, we hold your order (without obligation) pending final confirmation and payment of a separate sales invoice. You can negotiate with your installer for just basic installation as above, or more advanced pod finishing and customisation (read more below). If we are unable to assist by introducing you to an installer in your area, you can probably find a local tradesperson to install your pod according to the instructions provided. If you're handy with tools, you could probably put it together yourself with a little help from your friends. You can purchase extras (door, windows) through local building suppliers or recyclers. Image (right) is an example of an elevated pod kit (different size) completed with the owner's choice of extras and customisations. Installers can help you with all kinds of pod-based customisations - even joining two large pods together to make a whole house! Construction with pod kits is often half the cost of conventional construction materials and methods. Talk to us if you've got something unique or different in mind. While many backyard pods are successfully completed without any need for approval, regulations vary widely from State-to-State and region-to-region. 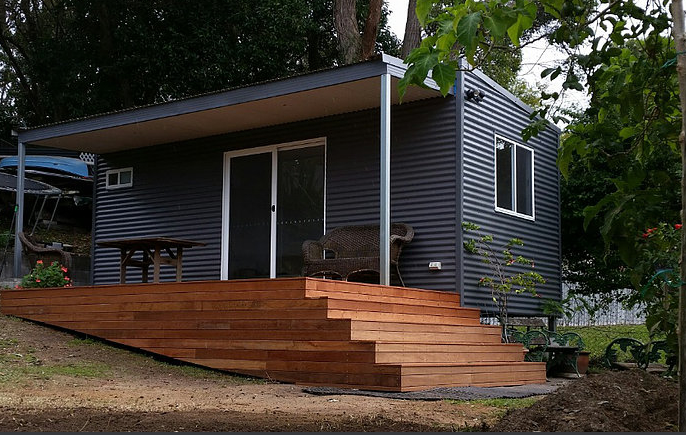 The NSW regulations for backyard pods and granny flats are straightforward, providing that certain basic conditions are met. 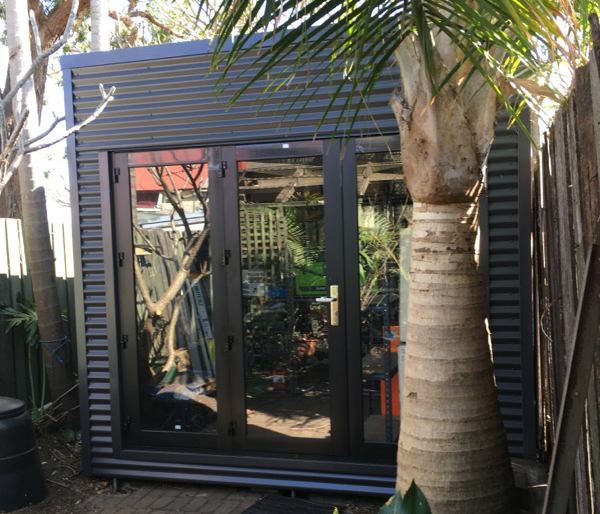 Whereas in NSW an experienced shed erector could install your pod, in VIC it's more likely you would need to have your pod kit installed by a licensed builder, or an owner/builder permit. It's your responsibility to ensure that whatever you're doing in your backyard is compliant with the State/local regulations specific to your site and intended purposes. If you're not sure about backyard building regulations in your State or local area, look online or check with your local council. When erected according to the instructions, backyard pods are suitable for certification as a habitable dwelling (eg: granny flat, self-contained cabin, etc) where applicable.